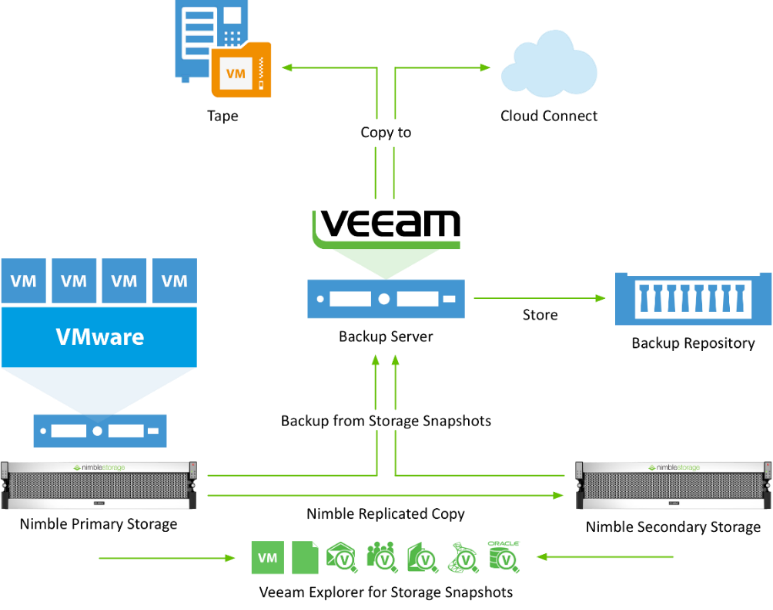 Advanced Integration with Nimble Storage coming in Veeam Availability Suite 9.5 for VMware! NOTE: Register for a VeeamLive session, Veeam Expands Storage Snapshot Integration to Nimble, on May 25. Storage snapshots are an everyday part of the modern data center regardless if you’re the virtualization administrator or the storage professional. One of the most popular requests from the Veeam user community is to bring direct storage integration to their favorite storage vendor array. Today we are happy to announce that in Veeam Availability Suite 9.5 we’ll be integrating with Nimble Storage. Why is Storage Integration Important? Protecting data in the environment is paramount to the success of the business. As an IT Pro, being agile and having the ability to recover any item, at any time and in any situation; that’s what the business demands. Unfortunately, due to the increasing amount of data in the environment, shrinking backup windows and demand for constant access to data 24x7x365 — this can become a challenge. To satisfy the Recovery Point Objectives (RPO) of the business, IT and Storage Professionals have the benefit of leveraging storage array-based snapshotting mechanisms. This provides nearly zero impact to the production Virtual Machines (VMs) running on the array allowing IT to protect the datastores in which their VMs reside on much more frequent than was possible with hypervisor snapshots alone. Unfortunately, the manual snapshot mount process is cumbersome and prone to user error. 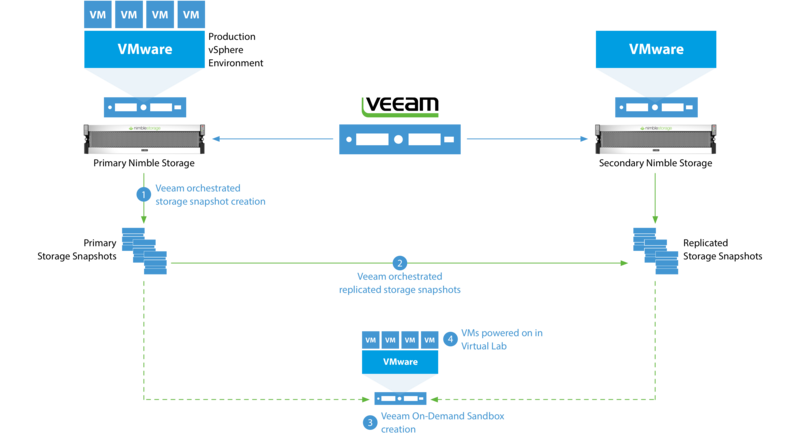 Schedule the creation of Nimble storage snapshots containing application-consistent VM images, and storage snapshot replication orchestration. Backup from Nimble storage snapshots or their Replicated Copies. Let’s take a look at how this is achieved with Veeam Availability Suite 9.5 with Nimble Storage. With Veeam Explorer for Storage Snapshots and Veeam Backup from Storage Snapshots, IT will be able to meet the Recovery Time and Point Objectives (RTPO) of the business. Array-based snapshots reduce the impact from data protection activities on the virtual production environment freeing system resources to further enable the virtualization of highly transactional VMs. To better explain, let’s take a look at a scenario. In our organization, Meeav Software, we run all of our VMs on the VMware vSphere platform, Nimble Storage and Veeam Availability Suite 9.5. On an hourly basis throughout the day we have scheduled application-consistent snapshots that occur on our vSphere VMFS datastores. These snapshots and their replication to secondary array are scheduled and orchestrated through Veeam Backup & Replication. Our secondary array is then being used as the source of our backup jobs once per evening. Utilizing the secondary array as the source eliminates any performance hit on the production infrastructure during the backup window. In the event of a SAN failure, you NEED out of band protection, as the data on both primary and secondary array may be corrupted. With Veeam Backup from Storage Snapshots, you can take production data off your SAN to isolated backup storage. To do that, we will instruct vSphere to take a snapshot of the required VMs. With this open snapshot, the Nimble device is then instructed to execute a storage snapshot action, following which we immediately remove the vSphere snapshot. As the result, production VMs run off VM snapshots only for a matter of seconds, eliminating performance overhead and infamous snapshot commit issues. Veeam then stores the VM data into self-contained, transportable files. Veeam Explorer for Storage Snapshots (VESS) allows Meeav to directly restore from the native Nimble snapshots (by using native snapshot scheduling engine, or Veeam) while benefitting from many of the restore options that Veeam provides. For instance, at 12 p.m. IT Support received a request to restore an email for the CEO just prior to his critical afternoon meeting. Much to the appreciation of the CEO, we were able to quickly reach into the Nimble Storage snapshot within the Veeam Backup & Replication console (VESS works in FREE Edition as well) to retrieve and restore exactly what was needed. Our IT Administrator also had the option of leveraging the Nimble replicated snapshot that lives on our secondary array to achieve the same result. Note: To take advantage of the advanced storage integration Nimble Operating System version 2.3 or later, vSphere 4.1, 5.x or 6.0 and Veeam Backup & Replication 9.5 or later is required. One challenge remains constant within modern day IT: How do I create test and development environments? Before we discuss the how, first it's important to understand the why. Whenever a request for a set of application VMs is received from the business, likely you're building multiple environments: Production, User Acceptance (UAT), Quality Assurance (QA), Development (Dev). Each environment has different controls in place for making changes as well as who has administrative access within each environment is different. The challenge for Developers is how can I get production-fresh data into my development environment? The other challenge for Senior Management, how do we know if our backups and availability strategy is good? How do we test patches and updates before applying them to the production environment? Even today, Veeam’s Virtual Lab technology addresses exactly these needs, providing isolated sandbox environments for test and development from backups – however, the performance may not be optimal for I/O demanding tasks. The integration between Veeam and Nimble gives IT Pros the ability to quickly standup sandbox environments directly from storage snapshots, or their replicated copies. This also allows development teams access in a fenced off environment to test their code against real production data using the full performance of primary storage arrays. Perform frequent crash-consistent and application-consistent Nimble storage snapshots and replicate them to secondary array for low RPO protection. Meet strict RTOs and RPOs by performing granular recoveries from Nimble storage snapshots on both primary or secondary arrays. Backup from Nimble storage snapshots on primary or secondary arrays, thus reducing (or completely eliminating) the impact from data protection activities on production workloads. Happy Availability with Veeam and Nimble Storage!